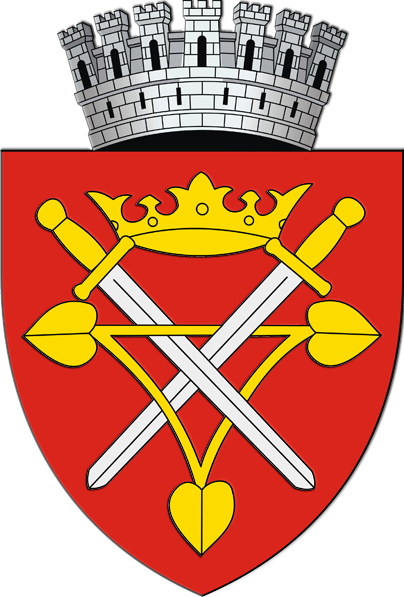 This is the coat of arms which the city of Sibui (aka Hermannstadt in German) is one of the more historic cites in Transylvania. It was originally a Saxon stronghold, and the administrative center of the Saxons in Transylvania. 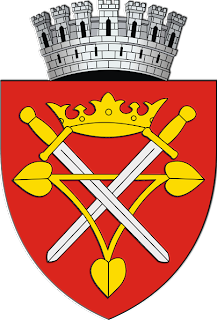 The thing which My eye goes to on this coat of arms is the fortified castle on the top, Sibui is one of the many fortified cites and churches in Transylvania. It is a major tourist attraction and because of this, makes money for Romania. Since you can use the airport to fly into other destinations, such as Munich it is possible to understand why there is such a draw for tourists. I suspect that the coat of arms is a strong part of the culture we can find within Sibui, and the fact that it was at one time the "crown" of the Saxons within Transylvania. thanks for the information, will you be doing more on this city?